Discussion in 'Nvidia Based' started by JimMariner, Dec 23, 2009. 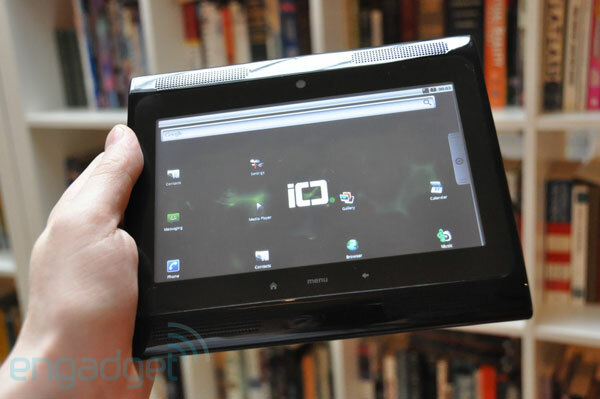 As you may have noticed, we had a chance to get our hands on a fairly interesting little tablet made by ICD dubbed the Ultra. The 7-inch, touchscreen tablet (resistive in the version we saw, but with capacitive versions to come) sports quite an impressive set of specs, including a 1GHz Tegra T20 CPU, 512MB of RAM and 512MB of ROM, 4GB of hardwired storage, 2G / 3G radios, WiFi, Bluetooth 2.1, a 1.3 megapixel front-facing camera, HDMI out, USB 2.0, and a microSD slot. The device also has an accelerometer, ambient light sensor, and 3.5mm headphone jack. The version we had a chance to play with -- a prototype running Android 2.0 -- was blazingly fast when it came to 1080p playback and web browsing (as you can see in the video), but was pretty incomplete as far as the rest of the software was concerned (though the company says they're working on optimizing the experience all around). In terms of pricing, ICD reps didn't have a solid number, though they said they expect the Ultra to sell for somewhere in the $249 price range, with potential for free, subsidized versions depending on what kind of deals they work out with partners. We expect to see a whole slew of devices like this at CES in just a few weeks, but this is nice a taste of things to come. Check out our exclusive hands-on pics in the gallery below!